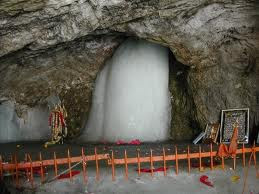 This Year Amarnath Yatra will start from 15th June 2012 -5th July 2012 ( only for 37 Days). For yatra Registration You need to apply in advance so that you could get Darshan ticket as earliest as possible. You also need to carry Medical certificate for amarnathji Darshan by an authorised doctor. his year, the yatra will be for 37 days beginning from June 15 and will conclude on August two coinciding with Raksha Bandhan as has been recommended by a sub-committee of board headed by Sri Sri Ravi Shankar. The Board further directed that all possible efforts should be made, in coordination with all concerned agencies, to make a timely assessment to determine whether it would be feasible to consider advancing the Yatra by a few days, prior to June 15. "Consequent to detailed deliberations, the Board accepted the recommendations of the Sri Sri Ravi Shankar sub-Committee and directed the CEO of the Board to timely commence the registration of pilgrims and ensure the effective management of the Yatra which would commence on June 15 and conclude on Raksha Bandhan on August two," the spokesperson said. 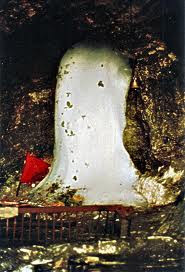 Amarnath Yatra is one of the famous Jyotirlinga among all twelve jyotirlinga of Lord Shivas, who ever does Darshan of this Ice Lingam will go to Heaven. the Importance of Amarnath yatra is mentioned in Ved and Purans. So Dont miss the opportunity to Visit Amarnath Cave . it is organised every year in the month of July and ends on Purnima on Raksha Bandhan evey year. he first to have Darshan of this Holy Cave. 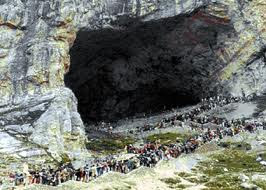 When people heard of the Lingam, Amarnath for them became Shiva's abode and a Centre of pilgrimage. The Yajurveda describes Shiva as ascetic warrior Whose robe is of Deer Skin and He carries Trishul . According to the verse Satyam, Shivam ,Sundaram ,the life is described as having three facets Truth (Satyam), Good (Shivam) and the Beautiful (Sundaram). Shiva is a living God. The most Sacred and ancient books of India, the Rig Veda narrates His presence in the hymns. Vedic myths, rituals and even astronomy testifies to His existence from the dawn of time .The Mohindaro and Harapa findings confirm Shiva worship in the ancient India. According to the older scriptures, He has three places of His residence. One is Kailash Parvat another is Lohit Giri under which Brahamputra flows and third is Muzwan Parvat . Amarnath Yatra is one of the well known Yatra devoted to the Lord Shiva or Mahadev located at the height of around four thousand meters on the Amar Nath Mountain in Jammu & Kashmir. 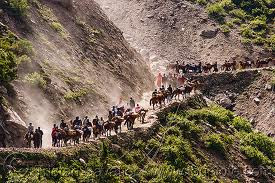 The Yatra of Amarnath is popular pilgrimage site for Hindus from the old days which is reported to be around 5000 years old. 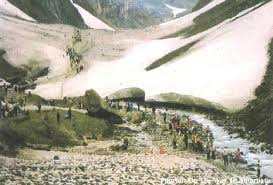 About 400,000 faithful devotees make their Yatra to Amarnath every year during the festival of Shravan Mela in June to August.There are several mythological stories related to Amarnath Yatra. 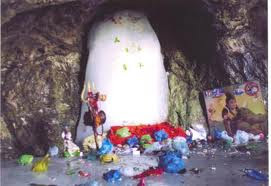 According to one of the mythological tales of Amarnath, it is here in the cave of Amarnath Lord Shiva revealed the secrets of immortality to his wife Parvati and therefore that place was named Amreshwar and has become the a sanctuary of Hindu community. 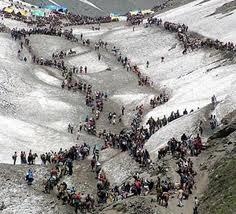 Amarnath Yatra attracted the tourists mainly for the Darshan of ice Shiva Linga along with two other ice formations representing Shri Ganesh and Mata Parvati. Though the holy pilgrimage to Baba Amarnath is one of the toughest Yatra of spiritual tourism of India, still the devotees of Amarnath flock to this holy cave every year in lakhs and lakhs. Broadly speaking there are generally three routes that take the tourists to this holy place of Amarnath out of which two are from roadways and one is by airways i.e by helicopter. Jammu to Pahalgam is about 315 Km that can be covered by the conveyance of Taxi and Buses. The Government of Jammu & Kashmir has provided the facility of running Taxi and Buses from Raghunath Bazaar early in the morning but the visitors can also come to Jammu by air and then move Pahalgam. 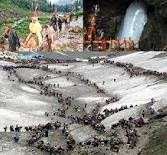 So, the holy Yatra of Amarnath starts from the first route of Pahalgam located at a distance of 96 Kms from Srinagar situated on the banks of Lidder River surrounded by the natural beauty of valleys and mountains. The important destinations covered under this route are Chandanwari 16 Kms away from Pahalgam, Pissu Top, Sheshnag second day’s trek of 12 Kms from Chandanwari, Panchtarni, and finally the Holy Cave Shri Amarnath. 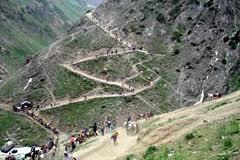 This is another route trek to reach to Amarnath from Jammu with a total distance of about 400 Kms. It is here on this trek route the visitors experience Jammu & Kashmir as a heaven or a paradise on earth while passing through the natural bounty of beautiful valleys, steeped mountains that make Amarnath Yatra memorable throughout the lifetime. The important destinations covered under this route are Udhampur - Kud - Patnitop - Ramban - Banihal – Kazi Gund - Anantnag - Srinagar - Sonamarg - Baltal. The width of the pebbled road is somewhat narrow in comparison to Pahalgam route. 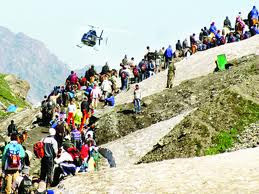 The holy Yatra to Amarnath glamoured the tourists when they are moving by helicopter passing through the tremendous wilderness, mountain and rambling forest. We are one of the best service providers with exciting helicopter rides to Amarnath. 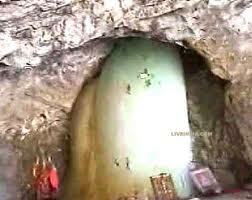 We are the best in market for helicopter Amarnath Yatra. Our helicopter services start from Sonmarg Baltal to Amarnath and Panjtarni to Amarnath. 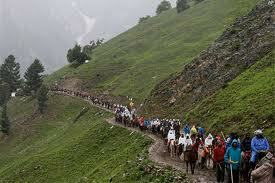 As Amarnath Yatra involves long distance of walking, so it is advisory to start preparatory morning / evening walk of about 4 - 5 Kms per day at least a month before the actual date of Yatra. 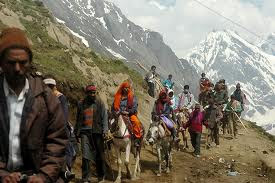 This will make your Yatra smooth and trouble-free as your body already accustomed with long walking. Apart from walking, daily massage of body with mustard (sarson) oil or body oil and bathe in the lukewarm water helps your body to become flexible and you will not feel tired. This will also reduce the effect of sudden change in temperature & climate to a large extent. As you walk through the trek, you may face the scarcity oxygen; that is why it is advisable to increase your body efficiency of oxygen through deep breathing exercise or through Yoga exercise like Prana Yam. You have to trek through high mountains like Pahalgam to Chandanwadi with an average walking distance of 4 hours; Chandanwadi to Sheshnag with a walking distance of 5 to 6 hours; Sheshnag to Panchtarni with a walking trek of 6 hours; and Panchtarni to Baba Amarnath Cave that finally takes 5 hours. While passing through these treks you may face number of problems like unpredictable climate that may change abruptly from sunny weather to rain and snow, the temperature may fall even up to (-5) degree C! So, prepare yourself by taking the essential belongings before departure. i) Carry dry fruits, baked grams, biscuits, sugar, candies, chocolates, milk powder, assorted dry fruits, pickles, honey, lemons and tinned foods or any small food materials suiting your palates. xvi) Keep the weight of the bag as less as possible to make a more comfortable trek. 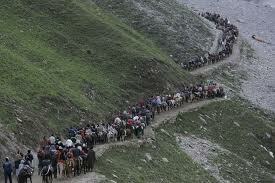 During Shri Amarnath Yatra, you must follow the instructions issued by the Yatra Administration. However, the following points are essential to remember. i) Always keep a slip in your pocket with your Name, Address and the name of accompanying Yatri. ii) You can hire registered ponywalla, porter, dandyman available for prefixed tariffs. iii) If you hire ponies to carry your luggage and eatables always get in touch with them to avoid inconvenience. iv) Have you heart the story of Hare and tortoise? So, move slowly and steadily, as this is an arduous pilgrimage and maintain discipline. v) You must carry sufficient money for your accommodation at Pahalgam and to meet other requirements. vi) All medical facilities are provided free of cost but it is advisable to use personal medical kit. vii) Perform Yatra with a pious mind and keep enchanting “Om Namah Shivay” all the way. viii) Keep your clothes and eatables in plastic bag to avoid the things being drenched during the rain while moving onward to Pahalgam.